Hogbacks, end view of both, dated to the first half of the tenth century. 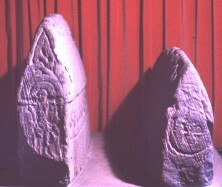 The hogback on the right has depictions of warriors on the side. It is known as the warrior's tomb. The end (west view) has the remains of a curled and contoured ribbon animal bound in thin strands of interlace. The hogback on the left is known as the saint's tomb. The end has a triquetra with the strands splitting and interlacing at the crossing point, at the top set within the eaves. Below this there is a crucifixion scene. Christ is shown without a cross but his arms are extended. There are two curved plain mouldings above his head, which may be a nimbus (? ).